I have a CONFESSION to make. I have a product that has helped hundreds of thousands of cystic acne and blemish sufferers from around the world for the last 30 years, and to be totally honest, I’m not completely sure how it works. The Cut did a story about my confession earlier this year but let me explain everything in more detail. I discover a new product with a little-known ingredient called lactic acid. At age 19, I am a brand new esthetician and just starting out my career. I worked at a salon outside of Boston giving facial treatments and selling a skincare line they had brought in. A barely-known ingredient called lactic acid (an alpha hydroxy acid to lower the skin’s pH and dissolve dead cells) was used in one of the products. The product came in a box with three glass vials (ampoules) that you would break open to use. It claimed to exfoliate and control sebum (oil) to help improve acne. I would sell this product to my acne-prone clients and instruct them to use it all over the face at night. While it was giving some improvement for some people with acne, a lot of my clients were getting dried out from using it every single night. I had them cut back to a few nights a week and that seemed to be more manageable. My clients share feedback about an unintended benefit from the product. Here and there, I’ve started to get feedback from some clients (especially young adults) who were using it as a spot treatment on cysts, and said it was working miracles to get them to go down faster! Huh?!? Cysts? This surprised me as the only solution for cystic acne at the time (and still to this day, actually) was to get a cortisone injection from a dermatologist. For severe cases, you could take an oral prescription like Accutane but that was about it. 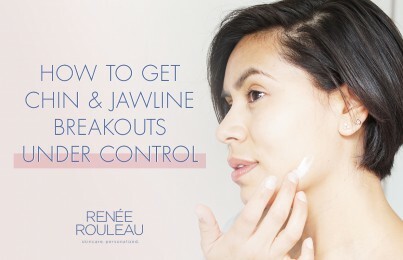 There wasn’t any topical product that would help for this specific type of breakouts. With this newfound discovery, I increasingly recommended this treatment, mainly for people with cystic acne bumps since I knew this was a sure thing. However, I wasn’t entirely sure how the treatment worked. Lactic acid was still very new to the scene so there just weren’t many studies about its effectiveness for any skin condition—let alone for cysts. However, I wasn’t worried about this much. I mean, the product worked and was showing great improvements for my clients so I was satisfied with that. I develop adult hormonal cysts on my chin and jawline. By 1993, exfoliating acids had become increasingly popular. Glycolic acid was the superstar acid for exfoliating the skin, while lactic acid was still fairly unknown. The awareness of skincare ingredients, including the benefits and disadvantages, were pretty limited so I was still unclear as to how this product was working. By the way, I was also a first-time business owner! 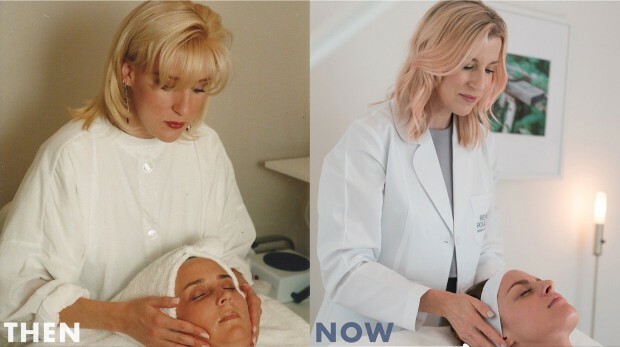 Three years earlier in 1991 when I was 21, me and a co-worker from the previous salon opened up a skincare clinic together. Elizabeth Renée Esthetics in Wellesley, MA. Things were going great and I balanced my life as both an esthetician and a girl boss. My product launched under my own brand. 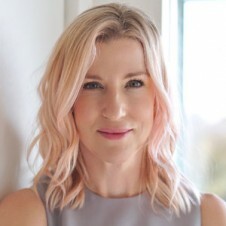 I sold my half of the partnership and moved out of Boston to start Renée Rouleau Skin Care in Dallas at age 26. While I opened as a skincare spa offering facial treatments, I set a goal to also create my own line of products. I asked the company who made the lactic acid product if I could purchase it from their line. They actually didn’t even sell that much of it, probably because no one had discovered what miracles this product was making for a very specific condition—cystic acne. 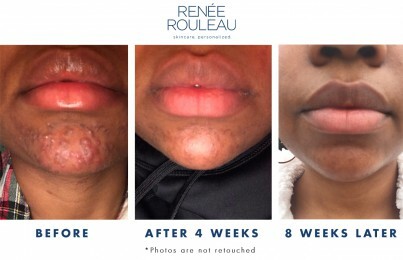 The company discontinued it from their line and I officially launched Renée Rouleau Anti Cyst Treatment to reflect the benefits it gave for cystic acne. The crazy thing is, I never bothered to get with their chemist to understand how the product was working for cystic acne. I suspected that they didn’t really know since it was never on their radar to market it for this condition in the first place. However, Anti Cyst Treatment isn’t selling much compared to the other products in my line. Looking back on it, I’m guessing it’s because cystic acne is a relatively small market. Adult hormonal acne was not as prevalent back then as it seems to be now. (Read how to prevent adult hormonal acne). As for teen acne, most of them get pustular acne and not cystic acne so there just wasn’t a huge demand. In my skincare spa, we’re selling it to any client who gets stubborn bumps and cysts under the skin and they are getting excellent results with a quick recovery. Same formula with rebranded packaging. Celebrity, Lisa Rinna makes Anti Cyst Treatment a star! Sales for Anti Cyst Treatment are slowly increasing online as word travels. However one day, seemingly out of nowhere, sales of this product went through the roof. A printed issue of Star Magazine came out where celebrity, Lisa Rinna was featured as a user of Anti Cyst Treatment for her cysts. (Thank you, Lisa!) I was so happy to have a product that is helping so many people around the world and it was now getting the attention it deserved. Because of the feature in the magazine, it becomes a #1 best-selling product on our website. My attempt to find the original R&D files—with no luck. Now with this product in such high demand, I figured it was time to really get to the bottom of it. How does Anti Cyst Treatment work? I contacted the lab only to find out they had been acquired by another company a few years back. Since this product was discontinued from their line many years back, they tell me the original R&D (research & development) files are nowhere to be found. As for the original chemist who had made the formula, he had passed away back in the 80s so I couldn’t ask him. Over the next many years, I will attempt to learn how lactic acid, an exfoliant, is getting deep within the skin’s surface to heal up cysts—fast. Anti Cyst Treatment is now paraben-free with newly rebranded packaging. After a report released information that preservatives such as methylparaben and propylparaben might be hormone disruptors, consumers had questions about these ingredients and their relation to breast cancer. Despite the lack of scientific evidence to support such claims, I wanted to make a product that consumers felt comfortable with. However, parabens are frowned upon and most labs that I use no longer use them and have found other alternatives. For the last several years since the report came out, I had considered removing parabens. However, I was worried about changing up the formula. This is a cult product in my line and truly has been a miracle worker for hundreds of thousands of people around the world. What if it no longer worked the same? Anytime you make a change, there is a risk of it not performing the same as before. Our customers would be devastated. Whenever we are sold out, we literally have customers calling us crying in a panic. This is how important this product is to people. I took my time and did extensive testing of the new paraben-free formula with our top customers (who practically bathe in it!) and thankfully, no one noticed any change. Phew! We also launch our Zit Care Kit which includes Anti Cyst Treatment. This kit quickly became a best-seller. 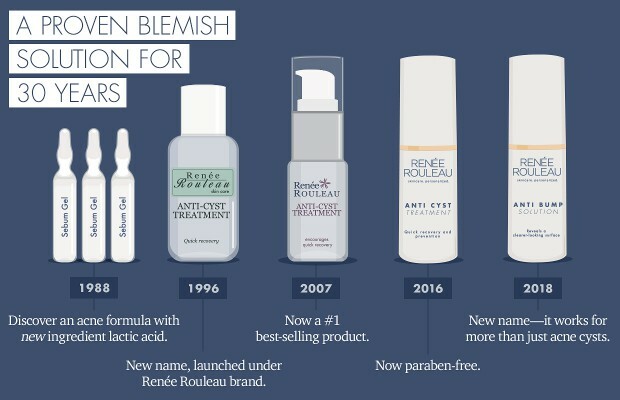 Same formula, but with a new name to reflect the benefits for other types of blemishes—not just acne cysts. The feedback I have heard the most in recent years in regards to Anti Cyst Treatment is that it seems to be beneficial for other types of blemishes. (I love customer feedback. Thanks, social media!) Particularly for pustular blemishes. These are the ones that come to the surface with an infected whitehead. Many people find that when spot treated as soon as they appear, they can make them surface faster. (The sooner it surfaces, the sooner it will go away!) Other feedback is that the pustules don’t seem to get as big as they normally would when this product is applied. With all of the feedback, I decided that Anti Cyst Treatment was too limiting and that since it seems to work for all types of painful bumps that start under the skin it is now called Anti Bump Solution. You can see how I recommend using it in this post, how to get rid of a blemish fast. Sharing my conclusions as to how the product might work. For the past five years, I have made a conscious effort to ask around to see if anyone has insight as to how they think this product works. This includes the teacher at UCLA where I trained in cosmetic chemistry as well as many trusted chemists. The conclusion is…no one is quite sure. Here is the ingredient list for Anti Bump Solution. If you look at the list, it’s really hard to decipher how this is working for painful bumps and cysts under the skin. In theory, lactic acid is an exfoliant that is not known to help with acne. Clogged pores? Yes. 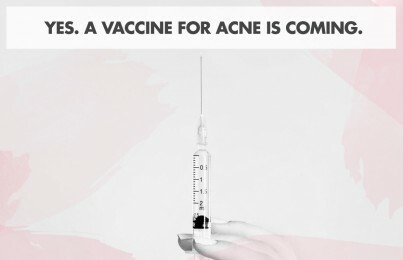 But active, painful infected acne? No. Many people think you can judge a product by the ingredient label. This is one example of how sometimes, you just can’t. What I have concluded is that it’s a blend of calming, anti-inflammatory ingredients and a sprinkle of magic fairy dust. Synergistically, this formula will put the fire out for any type of visible bumps and inflammation—fast. The truth is, it doesn’t really matter that it remains a bit of a mystery. It’s safe to use and it works, and that is what is most important. I started a journey 30 years ago to help others feel good in their skin so they can like what they see when they look in the mirror. I’m happy to say, mission accomplished with Anti Bump Solution. Does this product work for everyone? No, not everyone but this is the case for any skincare product. However, after more than 30 years, I can confidently say that it has improved symptoms of cysts and bumps for hundreds of thousands of people. If you have a sore bump under the skin, this may very well be a miracle product for making it go away faster with lesser scarring. Thank you to all who have enjoyed using this product through all of these years and for raving about it to your friends. I’m truly honored to be able to help in your quest for achieving your best skin ever. What’s another cult product for acne that makes a perfect companion to Anti Bump Solution? This two-step peel and mask treatment are amazing for anyone who deals with clogged pores, bumps, cyst and hormonal breakouts. When used at least once a week, you’ll get a big improvement in the overall smoothness and clarity of your skin. 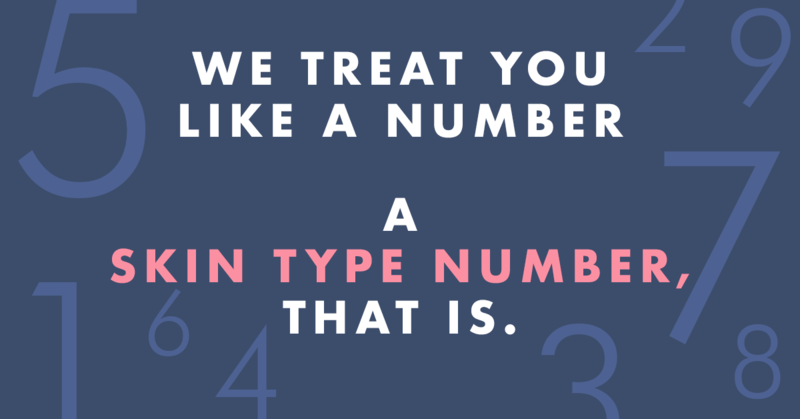 Be sure to look at my nine skin types and take the Skin Type Quiz to get the perfect skincare routine recommended just for you.